When we travel to Ethiopia, we visit the various churches – some dating back to 460AD. Each church has its own hand-scribed Bible and the oldest churches and monasteries keep their ancient Bible’s and texts under lock and key. Even today, there are scribes that know the Bible verse by verse and hand scribe Bibles on goat skin. There is a specific monastery that has a school for scribes still today. 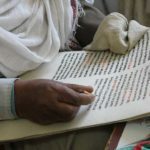 In a previous post we discussed that the oldest known Christian manuscript has been found in Ethiopia. It was dated to 330-650AD. There is also a specific monastery that teaches monks to build the replica’s of the Ark and tablets (tabots), as there are specific monastery’s that teach Yared’s liturgy. There are the remains of a Jewish Temple in the South of Ethiopia that has a church built over it. It was built in 400BC as the center for learning Judaic laws and for performing peace offerings. Visiting the church you will see the altar that was used for the blood offerings of goats, heifers and bulls. The sacrifices took place here in the South until King Ezana (321-360AD) replaced the practice with communion. It was King Ezana who formally converted the entire country to Christianity. King Caleb also visited the remote Temple. This small diocese is almost overrun by Islam, please let us know if you would like to visit this precious place. Contact us at [email protected] for more information on Ethiopia as a religious tour destination.